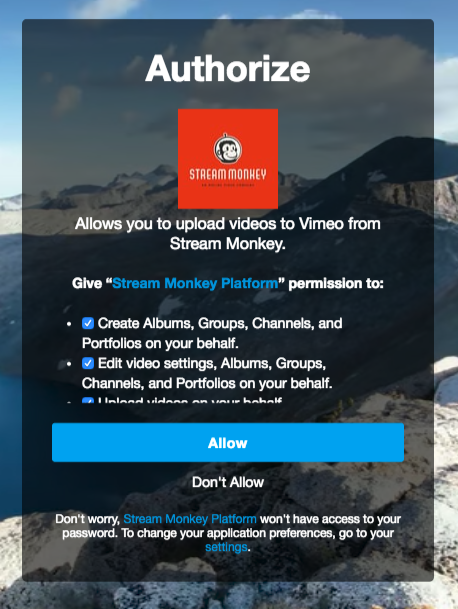 Stream Monkey's Vimeo integration is designed to allow you to create an On Demand file in our platform while also sending your video to Vimeo with one click of a button. No more logging into multiple platforms or uploading videos more than once! To get started, you'll need to link your account to Vimeo. Click Account in the left nav bar and it will reveal the section called Integrations. After you click on Integrations, you'll see a place to link your Stream Monkey account to Vimeo. After clicking on Authorize your existing Vimeo account, it will ask you to log in to your account and then on the next screen, you'll need to hit "Allow." Next, you'll go and create an On Demand video. When you are in the On Demand screen, you'll see a place to click and also upload to Vimeo. Simply check the box, and when you hit the blue check at the bottom to save, then it will send the video to Vimeo. That's all there is to it! A note on trimming/editing videos: If you want to trim a video with in and out points, you'll need to do that in the original save/upload screen in the File Manager. This will allow your trim edit to carry over to your integrations. If you trim in the On Demand screen, then those trims will only carry over to places where your viewer sees the video in our player, and will not apply to your Vimeo or YouTube videos.